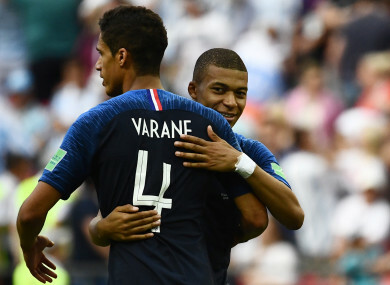 A FRENCH PLAYER should win the Ballon d’Or, with Raphael Varane, Kylian Mbappe and Antoine Griezmann the standout candidates, according to Monaco manager Thierry Henry. Real Madrid midfielder Luka Modric is the current favourite to win the award, having beaten Lionel Messi and Cristiano Ronaldo to the UEFA ‘The Best’ award. However, France won the World Cup, beating Modric’s Croatia in the final, and Henry feels that, as such, a Les Bleus player should be rewarded. He does, however, feel that Chelsea’s Eden Hazard is also in with a shout, having coached the winger at Belgium throughout the tournament. “I think it would be a shame if a French player does not win the Ballon d’Or, apart from Eden Hazard because he was extraordinary at every Wold Cup match – defensively and on the counter-attack,” he said, per Sky Sports News. But logically, a French player should win. Why not Varane? He won the Champions League, he was very strong. Mbappe, of course, made his name with Monaco and his reputation continues to soar with PSG. The 19-year-old is already a World Cup winner, and truly announced himself on the world stage in Russia, as he scored in the final, and also netted a brace in a classic encounter with Argentina. And Henry, while astonished at his rise, is unhappy that he does not have the teenager to call upon, with his side currently joint-bottom of Ligue 1. “We have a star. He is an outstanding player and let’s be happy that he is in France,” he added. “I would have liked him to still be here at Monaco. The match (against PSG, this weekend) would have been easier for us. Email “'It would be a shame if a French player does not win the Ballon d'Or,' says Henry”. Feedback on “'It would be a shame if a French player does not win the Ballon d'Or,' says Henry”.